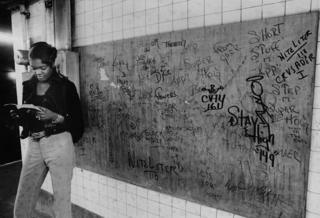 A new exhibition explores the history of modern urban graffiti - from its roots in the inner cities of Philadelphia and New York, through to the present day global graffiti movement. Masters of Invention - at the Lettering Arts Centre in Suffolk - looks at the emergence of simple personal tags in the late 1960s, to highly intricate contemporary forms of this urban art. It is curated by Errol Donald - a former graffiti artist whose work below was displayed in the UK's first exhibition dedicated to graffiti, in Bristol, more than 30 years ago. "This new show is a unique visual history of a letterform that has evolved from humble beginnings," he says. "It is now a highly complex and sophisticated form of design practice, still faithful to its subversive, inventive origins." Scroll down to see more of the work on display. 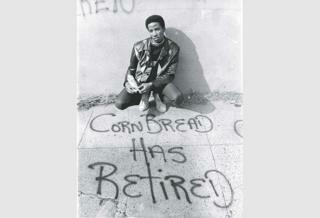 Cornbread, the pseudonym of Darryl McCray, is widely recognised as the first to popularise graffiti in the late 1960s. But in 1971 he announced his retirement, as recorded in this image from the Philadelphia Inquirer. 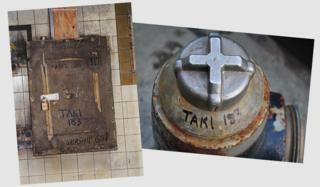 Over in New York, Taki 183 began writing his name all over the city. Shortening his real name, Demetrius, to "Taki" - which is slang for a number of Greek names - he accompanied this with his address at the time: 183rd Street in Washington Heights. 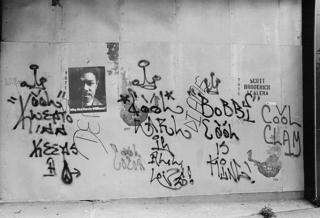 On seeing his signature tag, a reporter from the New York Times profiled him - which led to copycat tags across the city. 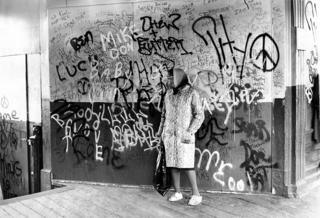 The next photograph - dated 15 June 1972 - shows more of the tag craze in the early 1970s. A woman is reading next to a US subway wall covered in tags by artists Flowers, Dice, CAY 161 and Stay High 149. 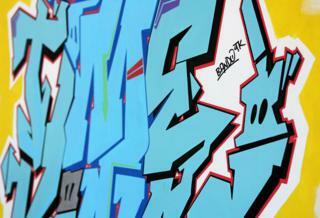 In graffiti terms, a tag is its most basic form. 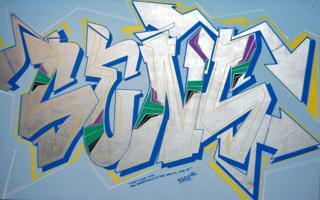 It is simply a writer's signature in marker or spray paint, although it will often be stylised. 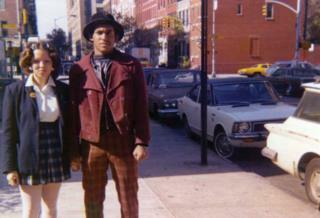 The photograph above, taken around 1970, is of a wall in Philadelphia. Artist Kool Klepto Kidd claims to keep the peace, Cool Earl declares he is all love and Bobbi Cool writes that he is king. 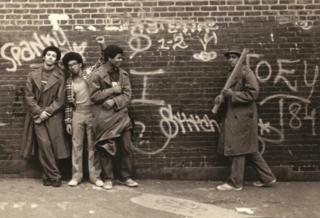 On the image above from New York in the early 1970s, curator Errol Donald says that "Stitch 1 was a legendary writer from Ogden Avenue in the Bronx and Rocky 184 was his girlfriend. "The pair met in 1969 on the corner of 188th Street and Audubon Avenue, which would eventually become known as Writers' Corner 188." "The fashion and the graffiti of the era could not be captured more perfectly than in this photo from 1973," says Donald. "Snake 1, Static 5, Flash 191 and Stitch 1 at the PS 189 school yard in Washington Heights, New York." The next 1970s image - from a Philadelphia subway station - shows a woman standing in front of a large TITY peace sign marking. 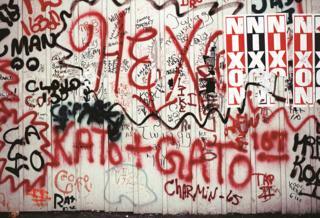 While in the Bronx in New York, torn Richard Nixon political posters co-ordinated with the red and black tags of writers such as Charmin 65. Bando, real name Phillip Lehman, grew up in Paris and New York. 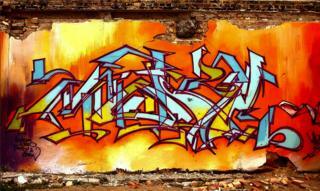 In the 1980s, he began the Crime Time Kings, a graffiti crew from across Europe made up of himself, Mode2 and Shoe. Born in Mauritius, Mode2 came to London in 1976, becoming one of the forerunners of the British graffiti and street art movement. Covent Garden in London was the centre of the UK's hip-hop scene in the 1980s and was where he founded the influential graffiti group The Chrome Angelz. 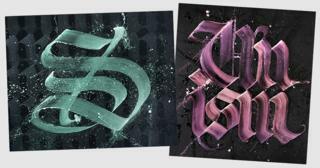 Image copyright Niels "Shoe Meulman"
Known for his paintings that blend graffiti and calligraphy, Niels "Shoe" Meulman initiated the Calligraffiti movement. The visual artist, who has work in the The San Francisco Museum of Modern Art, has said about his work - "a word is an image and writing is painting". 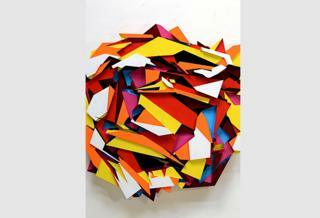 Delta, the alias of Boris Tellegen, is a Dutch artist who also has roots in the 1980s graffiti scene. After studying at Delft University of Technology he began to experiment with sculptural versions of the graffiti style using bright colours. 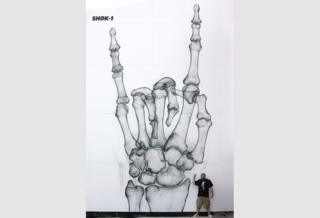 A student of applied chemistry, Shok-1 spray-paints his art - which is based on X-rays - on to walls around the world. 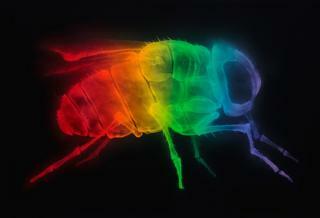 He creates freehand - without stencils or tape - blending art and science. 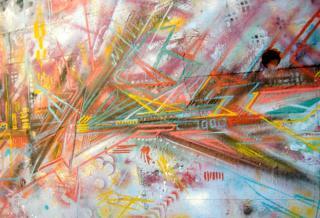 Yorkshire-born artist Keith Hopewell creates art under the name of Part2ism. 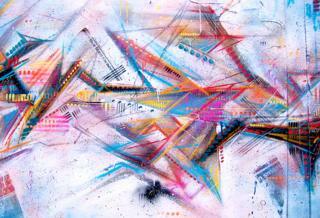 His complicated, colourful pieces are a long way from the early tags that covered walls in New York and Philadelphia. Finally - the work of Zaki Dee - another founding member of The Chrome Angelz group. Dee began creating in 1982 - and now, after a hiatus of several years, he has returned to the graffiti scene, painting several walls in and around London. The Masters of Invention exhibition runs from 24 March - 29 May 2017 at The Lettering Arts Centre, Snape Maltings, Suffolk.